Rum is inexorably bound up in the history of the Caribbean and North America. From the mid-17th century through the early 19th century it was at the center of a complex web of trade that transformed the culture, ethnicity and economy of the West Indies and also had a profound impact on the economic development of eastern North America. Caribbean salt flowed north to the cod fisheries of New England and Newfoundland's Grand Banks where it was used in prodigious quantities to preserve the cod harvest. Cod was both the single largest, new source of animal protein in the 17th and 18th centuries as well as the least expensive. It was widely used to feed slaves on Caribbean sugar plantations. That's why salt cod still figures prominently in the national cuisine of the West Indies even through the nearest cod fishery is more than a thousand miles away. In turn, molasses, a byproduct of sugar refining flowed north where it was fermented and distilled into rum. After Barbados, New England was the largest producer of rum in the world annually producing more than 1.2 million gallons. The first commercial rum distillery in the world was built by Dutch merchants on Staten Island in 1664. Rum was widely traded: to Newfoundland fisherman for salt cod, to Native Americans for fur pelts and to West African slavers to feed the prodigious demands for slaves on the West Indies sugar plantations. Barbados's rich soil and flat terrain made it the center of the West Indies sugar boom, simultaneously the largest producer of sugar and rum in the world. Rum production started as early as 1637. The Mount Gay Distillery dates back to 1703 and is today the oldest continuously functioning rum distillery in the world. Now owned by the French spirits company Remy Cointreau, it is also at the center of a rum revival. During the height of the sugar boom in the 18th century, Barbados rum was considered the finest rum in the world. George Washington insisted that Barbados rum be served at his inauguration. That was technically illegal as the Continental Congress had banned British imports, including rum from Britain's Caribbean colonies. Washington didn't feel New England rum was of sufficient quality for a presidential inauguration. He got his barrel of Barbados rum. Nor was this the first time that Barbados rum had lubricated George Washington's political career. When Washington first ran for the Virginia Legislature, the House of Burgess, he thought his status as a 23 year old war hero of the French and Indian war would be sufficient to get him elected-it wasn't, he lost. When he ran again in 1758, he supplied his potential voters with 28 gallons of the finest Barbados rum, another 50 gallons of rum punch, 46 gallons of beer and 2 gallons of cider. That amounted to a half gallon of booze for every eligible voter. He won in a landslide. The Mount Gay distillery was originally called the Mount Gilboa Plantation/Distillery. John Sober purchased the operation in 1747 from William Sandiford and appointed a trusted friend, John Gay Alleyne, to manage it. Under Alleyne the distillery became known for the quality of its rum and was extremely successful. Alleyne was also a respected community leader who served in the Barbados Parliament for 40 years, including two stints as Speaker of the Barbados House of Assembly, and, notwithstanding his role as a sugar grower and distiller, was also a vocal opponent of slavery. On his death in 1801, the distillery was renamed Mt Gay, after his middle name. There was already a Mt. Alleyne named after him, so the distillery opted to use his middle name instead. Pot still with retort at the Mt Gay distillery. 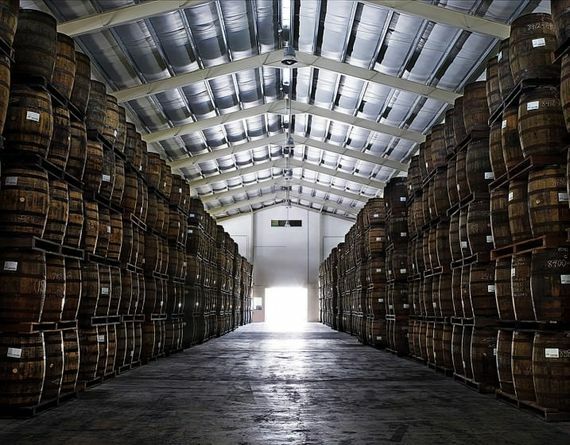 For the last half century Barbados rum production has relied primarily on molasses imported from Guyana and to a lesser extent the Dominican Republic. Local production was insufficient for the rum industry's needs. What molasses was produced locally was simply blended with imported stocks. Mt Gay has now embarked on a significant expansion that will see it produce its own molasses from its own sugar cane fields and release specific Barbadian molasses bottlings of rum. It's not clear, at this point, how far this experiment in "rum terroir" will go. According to the distillery in time this project may include rum produced from specific sites in Barbados and possibly even specific varieties of sugar cane. In addition, taking a page from Scotch whisky producers, Barbados rum producers, including Mt Gay, have been experimenting with exotic cask finishes maturing their rums for one or more years in casks that previously held other liquids, typically sweet and fortified wines like port. The Foursquare Rum Distillery has already released a Port Cask finished rum. Mt Gay has its own version currently maturing which is expected to be released in the next year or two. Caribbean rums vary in style from the highly aromatic, at times pungent, Jamaican-style rums to the very light Cuban-style rums designed for cocktails. Barbados rums fall in the middle, generally lighter in color and body than Jamaican rums, drier, and with the characteristic, but less pronounced, aroma profile of molasses based rums. Overall, Barbados' golden colored rums tend to be subtler, nuanced and more aromatically complex than their Caribbean neighbors. Fermentation at Mt Gay is a relatively quick two to three days. Molasses is mixed with water and then boiled to sterilize it. The ratio of molasses to water varies depending on the sugar content of the molasses but generally is between 2 to 4 parts water to 1 part molasses. The wooden fermenters are open topped and utilize a proprietary strain of yeast. The distillery does not use temperature controlled fermenters. This is typical among Barbados distillers. The persistent trade winds, especially at the north end of Barbados where the Mt. Gay distillery is located can be relied on for cooling the fermenting molasses and dissipating the heat generated. Distillation is in a combination of pot stills and column stills. 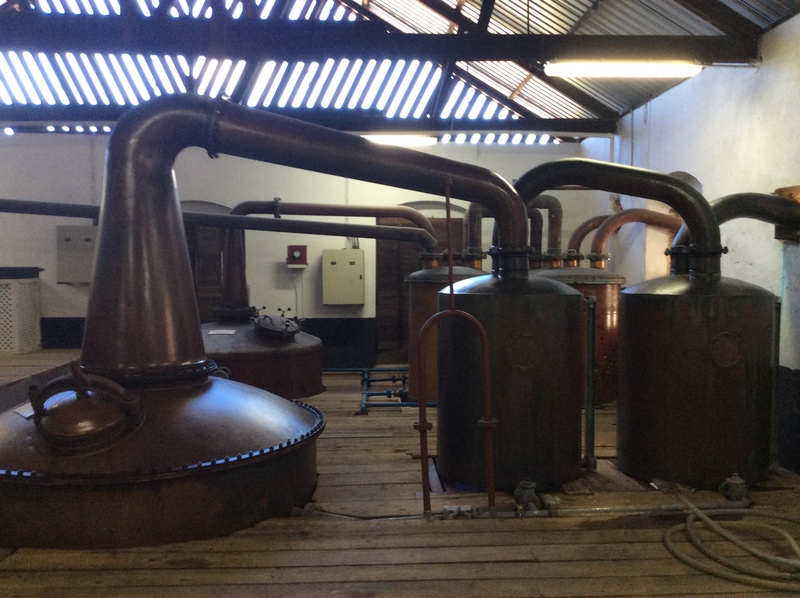 The same wash will be fed to both types of stills in proportion to the distillery's blending needs. 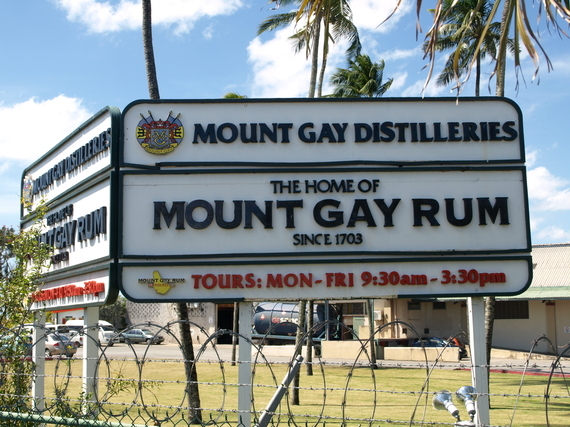 Mt Gay's rums are typically a blend of pot and column distilled rums with higher end expressions receiving a greater proportion of pot still rums in their blend. One unusual feature of Mt Gay's distillation is the use of a retort. Retorts are pot like container that receive the vapor from the still. They are "charged", i.e. filled with more wash so that the vapor from the still passes through the wash further extracting aromatic compounds from the wash. The practice is also found in Bourbon country. There, these retorts are referred to as "thumpers" for the distinctive noise they make when they are being operated. Maturation typically takes place in refilled 200 liter American bourbon casks. Mt Gay also utilizes the more heavily charred Tennessee whisky barrels for maturing a portion of its rum. It's not clear however where rum aged in these barrels is segregated and used in blending, whether it is used disproportionately in the Black Barrel bottlings or simply mixed in with the bourbon barrel matured rum. The distillery has a total of 4 warehouses holding thousands of barrels of maturing spirit. The barrels are palletized and typically stacked 5 to 6 layers high. The warehouses are positioned to take advantage of the prevailing wind for ventilation. Given Barbados's location in the tropics, seasonal variations in temperature and humidity, the two factors that most affect the maturation of spirit, are minimal. Typically in the warm Caribbean, spirit ages up to three times faster than comparable spirit in cooler climates like Scotland or Cognac. The rum is typically matured at around 68% alcohol by volume (ABV) and reduced to 43% ABV at bottling. Unlike some other Caribbean producers, Barbados rum distillers are not allowed to add any sugar to their rum. The only allowed additions are caramel for color and water to dilute to bottling strength. The result is the distinctive dryness that is typical of Barbados rums. The Barbados Rum Committee is the rum industry trade association in Barbados. There are only four rum producers on the island so the organization is somewhat informal. The Committee in turn belongs to the West Indies Rum & Spirits Producers' Association (WISPRA). The association acts as a regional wide trade promotion organization. It also the Authentic Caribbean Rum (ACR) marque "as a symbol of authenticity, provenance and quality". Currently there are three different ACR tiers. The basic tier certifies that the rum has been produced from either sugar cane juice or molasses within the ACR designated Caribbean region and that it meets accepted industry standards of quality. The second tier "Matured Authentic Caribbean Rum certifies that the rum has "been 100% matured for a minimum of one year". The gold and black "deluxe" classification is used on rums that have been "100% matured for a minimum of five years". Historically, most rums did not carry an age statement, although this has started to change as the industry has started to focus on more upscale bottlings. 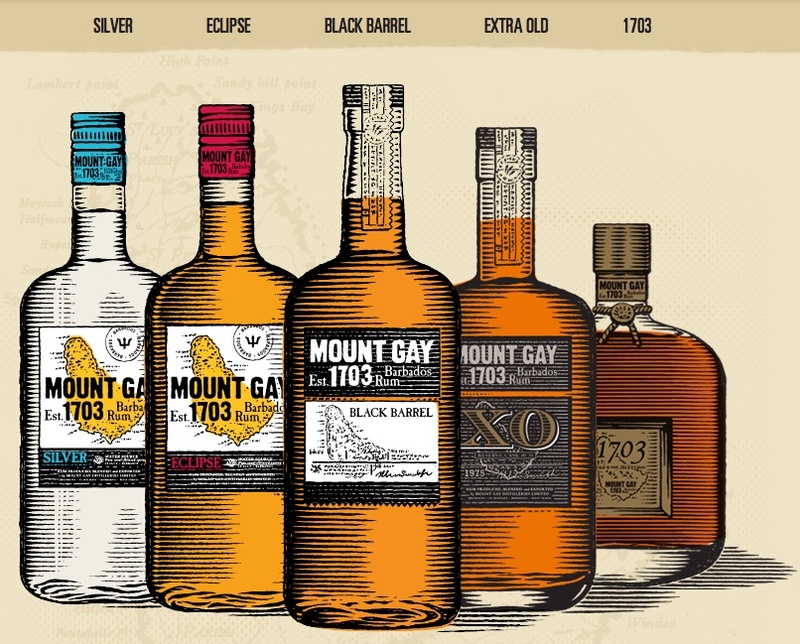 Currently, Mt Gay's top tier of rums includes Mt Gay XO (Extra Old), Mt Gay Black Barrel and its top ranked specialty bottling 1703. A lower priced tier includes Mt Gay Silver Eclipse, Mt Gay Eclipse Black, Mount Gay Eclipse and Mount Gay Special Reserve. Mt Gay XO, 43% ABV, consists of a blend of double pot distilled and column still rums that have been aged from eight to fifteen years; with the average weighted heavily towards pot still rums. The appearance is a rich, dark amber. The nose shows the expected butterscotch aromas but drier with hints of tropical fruit and old leather; typical of the lighter style of aged Barbados rums. The nose grows more complex as the rum opens up exhibiting more tropical spice, especially cinnamon notes and distinctive aromas of ripe banana. On the palate it is rich and weighty, with very slight sweet notes tempered by a woody, tea leaf dryness, and tropical fruit elements of ripe banana and hints of mango as well as baked green fruit notes of apple and pear. The finish is long, smooth, with pepper and spice notes and an unusual, for rum, hint of buttery croissant. It ends on a refreshing slightly bitter note. This is an excellent after dinner sipping rum but over ice or with a touch of soda will also make an excellent aperitif. Mt. Gay Black Barrel, 43% ABV, is a small batch blend, first released in 2014, that undergoes finishing in much more deeply charred Bourbon oak barrels. It's not clear if Tennessee Whiskey barrels are also used in the Black barrel blend. Like the XO it consists of a blend of pot still and column still rums. The distillery does not specify the age range of the blend components. The appearance is a light amber color. The nose of the Black Barrel is slightly sweeter, and a bit woodier than the XO with slight hints of smoke. Initially it exhibits floral notes followed by pronounced creamy vanilla notes and over ripe/cooked fruit flavors. The palate is spicy, with creamy vanilla, pepper and distinctive ripe banana notes followed by hints of licorice. The finish is long, dry, with peppery and spicy notes that linger. Like the XO it is a good sipping rum, especially if you like dryer bourbons but over ice or with a bit of soda it too will make an excellent aperitif. 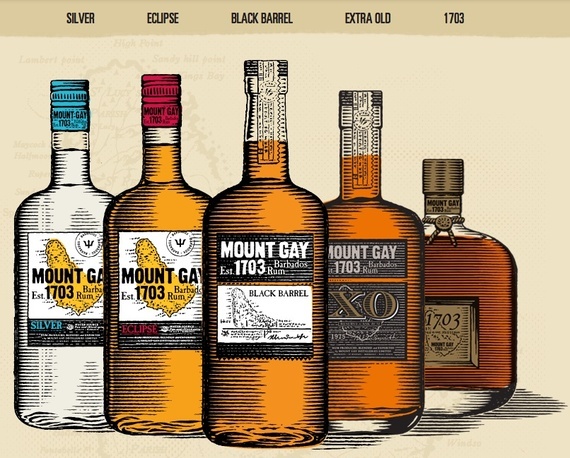 Mt Gay 1703 is made up of handpicked old casks of double distilled pot still rums and single column still rums. Named after the year the distillery was founded it is blended by Mt. Gay's master distiller Allen Smith from rums ranging from 10 to 30 years old. The color is a rich, golden amber. The nose is dry with rich notes of old lacquered wood, saddle leather, sweet tropical spices, honey and hints of butterscotch and licorice. The palate is equally dry with pronounced notes of cinnamon and nutmeg followed by mocha and hints of bittersweet chocolate. The finish is smooth, long and complex with notes of old lacquered wood, dried fruit, candied citrus, and Christmas pudding. Definitely a rum to be savored in a brandy snifter. As the Mt Gay distillery enters its fourth century it remains on the cutting edge of the world's finest rums and at the forefront of the revolution sweeping the world's rum industry. An essential part of any rum collection, this is a rum to be savored, a rum that is perfect for any occasion.